We are a diverse, motivated group of volunteers working together toward common goals. Our members come from all age groups, walks of life, and backgrounds; each member brings unique skills and abilities, yet all share the love of being outdoors protecting and enhancing our forests. CLICK HERE TO LEARN MORE + JOIN NOW! We're dedicated to assisting the Forest Service and other resource management agencies in maintaining, protecting, and restoring the natural and cultural resources and the scenic beauty of our forest lands for the enjoyment and use of present and future generations. We are a solution-oriented volunteer group that works in partnership with these agencies to assist in tasks they do not have the staff or the funds to accomplish. It has been an unusual and challenging year for us due to the lack of snowfall, drought in the spring and early summer months, and then high moisture situations in late summer into fall. But in spite of these conditions, FoNAF and the Aspen Team made significant contributions overall again this year. We contributed over 3563 volunteer hours this year to a variety of events and projects. The Aspen Team alone contributed 2455 hours. From an environmental perspective, the team also collected and recycled 5 tons of scrap metal. · “Organization of the Year” presented by the Arizona Daily Sun. · “Climate Action Hero Award” from the Arizona Wildlife Federation. The actual awards are hung in the lobby of the Flagstaff Ranger Station. While membership is holding steady, we have a consistently high level of participation at more than 50%. These are active volunteers in our projects and community service activities. The board’s consensus was that this is a very high percentage for volunteer organization. Tom emphasized it was another productive year for FoNAF and he is proud of our many contributions. He is very pleased with the outstanding support of the Forest Service through the efforts of Mark Nabel, Cary Thompson, Patrick McGervy, Tom Runyon, Roger Joos, Gary Hayes, and many others. Tom also recognized the Arizona Game and Fish Department for use of their tools and vehicles. 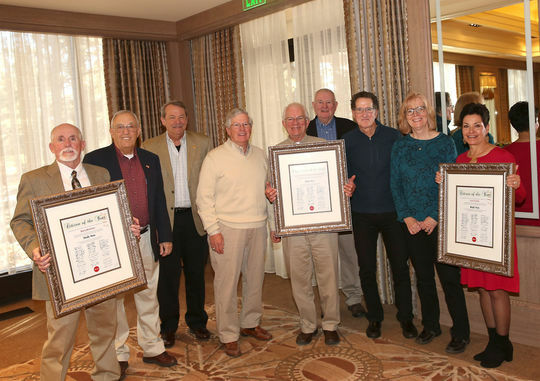 In addition to the above, new partnerships were formed with Grand Canyon Trust, Diablo Trust, Society for Range Management, and NorthernArizona Forest Fund. Friends of Northern Arizona Forests was chosen by the Arizona Daily Sun as their top organization for 2017. The announcement was made in their December 30, 2017 issue. On January 9, 2018, a luncheon at Little America honored the "Male" and "Female" persons of the year as well as FoNAF, organization of the year.